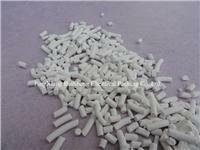 Molecular Sieve 13X APG is specially designed to co-absorb CO2 and H2O for air cryo-separation industry. It has largeer capacity and faster adsorption speed for removal of CO2 and H2O to prevent the bed gelation, it is suitable for any air cryo-separation plants of any size and any types in the world. 13X APG- Zeolites are available in beads of 1-2 mm, (10x18 mesh) 2-3 mm, (8x12 mesh) , 2.5-5 mm, (4x8 mesh) and as powder, and in pellet 1.6”, 3.2”.